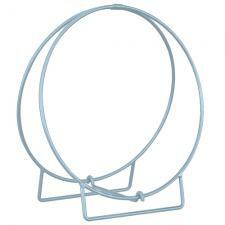 *Stainless Steel Log Hoop will not rust. *Measures 40" High x 36" Diameter x 16" Deep. *Heavy duty 1/2" diameter stainless steel bar design - will hold up to years of use. *Made by Uniflame and weighs 17 lbs.